After eating the Golden Bowl at The Good Co, I wanted to try the other bowls so with 3 friends to share all my food, we went there again. Ocean Bowl - MYR30 nett. The cold icy smoothie purplish blue colour is from the butterfly pea flower. Luckily the colour is not as blue as shown in the online shop menu. The taste of this smoothie is very subtle - honeydew and lychee with no indication of banana though it is in there. 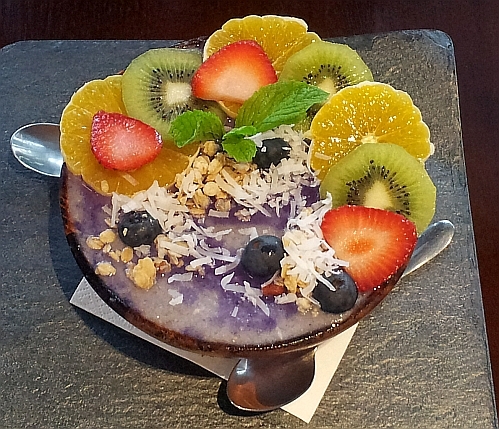 The toppings of orange, kiwi, strawberry, blueberry, coconut, mint leaves and granolas add more depth to the taste. My friends prefer Ocean Bowl to Hana Bowl. Hana Bowl - MYR28.90 nett. I would say that this smoothie has a tangy mixed berries taste since it is made up of strawberries, mulberries, raspberries. Similar to the Ocean Bowl, I could not taste the banana in it although it is there which is a good thing to let me enjoy the berries taste. Toppings are: a pretty mango rose, coconut, pumpkin seeds, granolas, mint leaves and dried cranberries instead of mulberries. One day, I will be back to try the Acai Bowl (MYR25.90 nett) which is made of Acai Powder and mainly Red Dragon Fruit. If you feel like eating ice desserts and want a healthy version, go for these pretty yet very delicious smoothie bowls which is only slightly sweet. 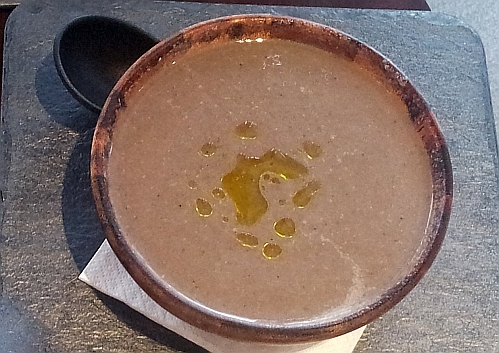 Wild Mushroom Soup with Truffle Oil - MYR14.90 nett. I also ordered a Falafel Raita Wrap which I ate before to go with this soup. The Truffle Oil taste here is strong so for those who cannot stand strong smell like those of stinky beans or blue cheese, you must be adventurous enough to try this. 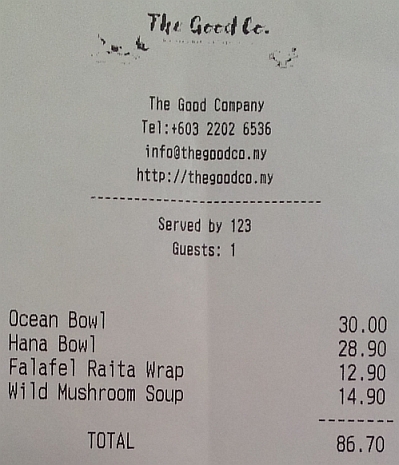 Total Bill for 4 pax is MYR86.70 nett. yes, they are very pretty! I wonder what truffle oil tastes like. Looking at the colour, I guess that was shitake mushroom soup? I think there are a few types of mushroom in there. Not so sure about shitake because shitake has quite a strong taste which I did not quite detect in here. I think better go try out a bit of truffle oil in restaurant before buying a bottle to keep at home. 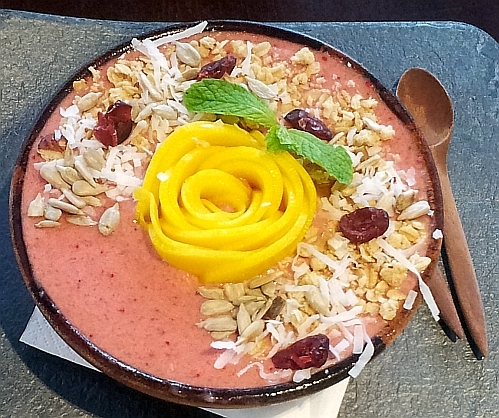 The smoothie bowls are so beautiful. Smoothies are so pretty... even got a mango rose. I still have truffle oil in my cabinet. Ya it's pretty strong, until I don't feel like using it. good presentation! eh, why did you buy truffle oil since you don't feel like using it? Hubby went to Italy... haha. I asked for a small bottle since he was there. He came back with 5 or 6.
aha he was feeling generous! you could sell the rest of the bottles and keep 1 bottle for yourself. yes they taste yummy too! I prefer the ocean bowl because I like fruits. ah, so you prefer the fruits in Ocean bowl than the fruits in Hana Bowl. Wow.. very impressive desserts there, Mun! not sure whether you will like them or not because they are not that sweet.